Where were you on Sept. 11, 2001? That's what former Green Beret Sgt. 1st Class Chris Spence asked students at North Marion High School during a presentation he gave to the school Thursday April 5. While most of his audience hadn't been born until after 2001, Spence said, it was a seminal moment in their parents' and grandparents' lives. "Ask your parents where they were. Each and every one remembers exactly where," Spence said. "Hopefully none of you have such a moment in your lives." Spence is a veteran of the Afghanistan war and graduate of North Marion high. 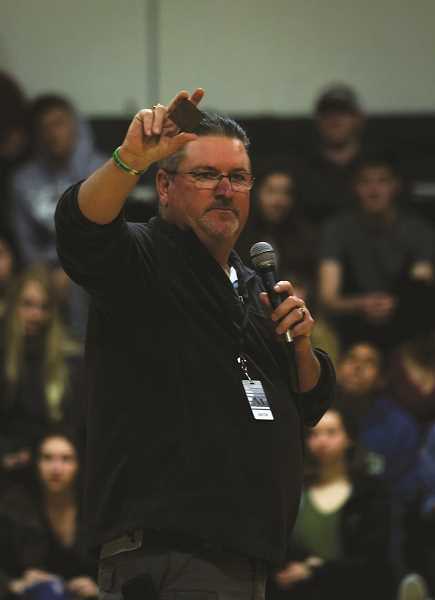 He visited North Marion on Thursday to speak about his experiences during the war and present the school with a small piece of metal from the World Trade Center that was destroyed on that date. "I figured, what a great place to donate this to, it's a piece of history they can hold on to," Spence said. The piece of metal debris was about the size of a playing card and dulled by rust, a small piece of much larger events. Spence asked that North Marion students build a display for the fragment when the school's woodshop reopens. Spence was among the first U.S. military personnel deployed in Afghanistan in 2001, traveling with a Special Forces team to link up with militants from the Northern Alliance, a group of warlords that had fought against the Taliban since the 1990s. Spence and his fellow soldiers traveled by horseback and donkey with Northern Alliance forces, taking part in fighting that captured Mazar-i-Sharif, the fourth largest city in Afghanistan and the first city captured by U.S. forces. Spence joined the Army in November 1986 after graduating from North Marion High School. His mother, Judy Spence, was a senior English teacher at North Marion. Spence now lives in Tennessee with his wife and has three sons, the youngest 10 years old. He said he missed out on time raising his two eldest sons, who are in their early 20's, during his military deployment. "I'm getting a refresher raising the youngest," Spence said. Spence served 25 years in the Army and now works for a small consulting company in North Carolina that teaches leadership and teamwork and employs mostly former soldiers and Green Berets. The actions of the Special Forces team Spence served with are chronicled in a book and film, "12 Strong: The Declassified True Story of the Horse Soldiers." His team is honored by a statue at the Ground Zero Memorial in New York City based off a photo Spence took.